Patent Ductus Arteriosus (PDA) is one of the most common congenital heart defects in dogs. The Ductus Arteriosus is a communication between 2 major vessels leaving the heart: the Pulmonary artery and the Aorta. In a normal heart, blood from the whole body enters the right side of the heart and is pumped into the lungs via the Pulmonary artery. After receiving oxygen in the lungs this blood returns to the left side of the heart and is then pumped into the whole body via the Aorta. Before birth, since the lungs are not yet working, the Ductus Arteriosus has the important function of diverting most of the blood from the Pulmonary artery into the Aorta. Shortly after birth the Ductus Arteriosus should close completely to direct all the blood coming from the right side of the heart through the lungs before returning to the heart. In some dogs closure of the Ductus Arteriosus does not occur or is incomplete and so they have a Patent Ductus Arteriosus (PDA) – “Patent” meaning “open”. Presence of a PDA causes profound changes to heart function. In normal conditions, the pressure in the Aorta is much larger than in the Pulmonary artery. As a consequence, a portion of the blood that should be carried to the body will be diverted through this communication into the Pulmonary artery and will go into the lungs again instead of the body. This blood adds to the blood coming from the right ventricle and this will result in an excessive amount of blood passing through the lungs and returning to the left side of the heart. The amount of blood will depend on the size of the communication. The PDA must be closed as soon as possible to prevent the left ventricle from going into failure due to the excessive amount of blood it has to deal with. The first step in diagnosing PDA is the detection of a heart murmur during the first visits to the vet. The detection of any heart murmur should always prompt a cardiovascular assessment to assess the cause and severity of the disease. A scan of the heart with ultrasound/Doppler – echocardiography – is performed for this purpose. Chest x-rays may also be necessary to assess the presence and severity of congestive heart failure. Cardiac ultrasound: PDA is visualised and examined. Direction and amount of blood passing through it is assessed. If detected in time this is the only cardiac disease in dogs that can actually be cured. For this to happen the PDA must be closed before irreparable damage is suffered to the heart. PDA occlusion may be performed with either open-chest surgery or a minimally invasive procedure in which a special device is deployed inside the PDA via catheters inserted in one of the hind limb arteries. Both techniques are very effective and safe if performed by experienced individuals. Minimally invasive procedures have the advantage of being less traumatic. 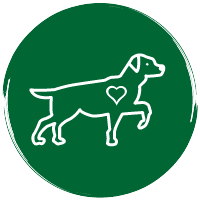 The cardiologist attending your dog’s case will advise on the best option for your dog since not all PDA’s can be treated by minimally invasive techniques. Patient size and anatomy and size of the PDA are paramount for this decision. If treatment is delayed or not performed at all your dog might develop congestive heart failure (fluid in the lungs). This can also occur in cases in which PDA occlusion is performed too late. These episodes are typically characterised by laboured breathing, cough, exercise intolerance and fatigue. Treatment is usually possible but it is essential that you seek veterinary care immediately if you recognise these signs, since without proper management death will occur, sometimes quickly, sometimes after a few days. Unfortunately most untreated dogs develop heart failure and die before one year of age.